FREE APPRAISAL. To buy, auction, sell or consign your Queen Victoria 1887 Jubilee Gold Medal that is for sale, please email Nate@NateDSanders.com or call the Nate D. Sanders Auction House (http://www.NateDSanders.com) office at (310) 440-2982. Queen Victoria reigned from 1837 until her death 1901. During this time, known as the Victorian Era, the British empire flourished as fertility rates increased, mortality rates decreased, the middle class grew as a result of the industrial revolution, and progresses in medicine and technology continued to advance. Nate D. Sanders Auctions has sold a Queen Victoria 1887 Jubilee Gold Medal, which celebrates the 50th anniversary of the queen’s coronation. Extremely Scarce Queen Victoria 1887 Golden Jubilee 22-Karat Gold Medal. Sold for $6,948. 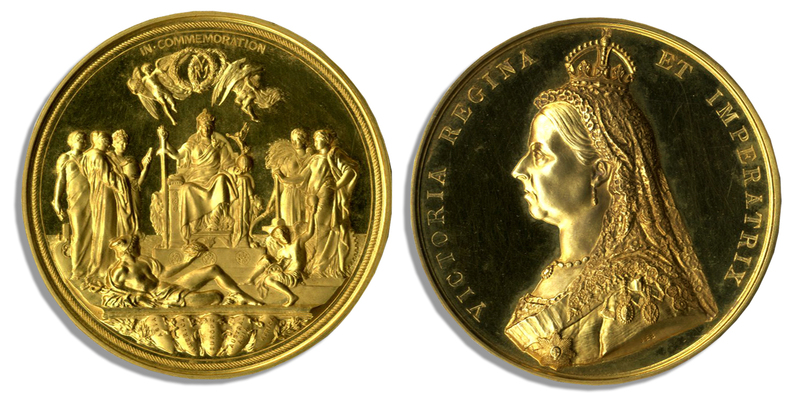 Gold medal minted in celebration of Queen Victoria’s Golden Jubilee, her 50th anniversary in 1887 as Great Britain’s monarch. This is one of just 944 such medals made of 22-karat gold. On the front of the medal, she wears her crown and a veil in a profile portrait designed by sculptor Joseph Edgar Boehm. Lettering curves around the perimeter, reading: “VICTORIA REGINA / ET IMPERATRIX”, Latin for “Victoria Queen and Empress”. The verso features the Queen’s Empire and its most valued institutions of Science, Letters & Art, Industry and Agriculture. Laurel wreaths overlap, with the letters “VRI” in the center. Shields of two cherubs are intricately inscribed “MDCCCLXXXVII” and “MDCCCXXXVII”. At the uppermost edge, “IN * COMMEMORATION” is centered. Five shields underscore the scene, each representing: “ASIA / AMERICA / EUROPE / AUSTRALASIA / AFRICA”, representing the vast expanse of England’s empire, upon which the sun never set. The artist who designed the verso, Frederic Leighton, was President of the Royal Academy, and his dies were engraved from a 3-dimensional model with the help of a reducing machine. One of these 944 medals, issued from July 1887 to February 1889, is on display at the British Museum. Medal is goldrated EF to FDC. Diameter measures 2.25″. Weighs 84 grams. A stunning and finely crafted piece of royal history. Extremely Scarce Queen Victoria 1887 Golden Jubilee 22-Karat Gold Medal. Click to enlarge.